(L to R) Mina Safain, MD, and Marie Roguski, MD, MPH, practice neurosurgery at MelroseWakefield Hospital and Tufts Medical Center. The brain and spine control everything we do. When they aren’t working properly, either from injury or illness, the body doesn’t work the way it should. MelroseWakefield Hospital provides comprehensive back, neck and neurosurgery services in the community for conditions of the brain, spine and nerves to help local patients regain their abilities to lead a full life. 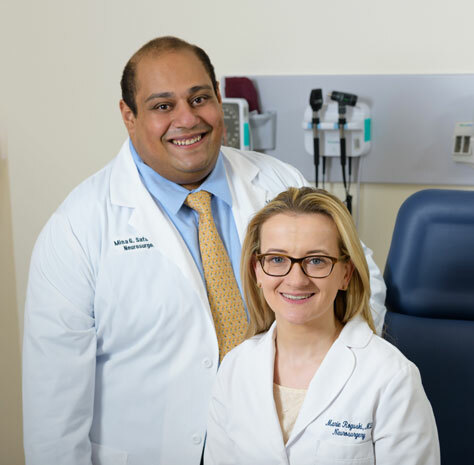 “Many of our patients are quite debilitated by their pain,” said Mina Safain, MD, a fellowship-trained surgeon who established MelroseWakefield Hospital’s neurosurgery services in 2017, in partnership with Tufts Medical Center. Our team of neurosurgeons has expertise in a full range of nonsurgical, traditional and minimally invasive procedures, including treatment for back pain, spinal disorders, aneurysms and brain tumors. In 2018, the service built on the success of its first year and grew steadily, increasing patient visits, surgeries, and conditions that can be treated locally at MelroseWakefield Hospital, including complex spinal fusions and cranial hemorrhages. The service welcomed neurosurgeon Marie Roguski, MD, MPH, who is fellowship trained in neurosurgical oncology at Memorial Sloan Kettering Cancer Center and specializes in brain and spine tumors, supporting the growth. Under the care of our neurosurgery team, local patients with debilitating conditions or life-threatening illnesses have recovered and regained their quality of life. From a patient who suffered from intense back pain after trying to lift a heavy object to a patient with vision impairment from a benign brain tumor, patients have a new lease on life. Having this level of care available locally gives patients access to neurosurgical specialists who are close to home and part of the community. The neurosurgery team is looking ahead at the possibilities to expand services even more in the coming year, including offering cranial surgeries onsite. Of all their success at providing advanced services to meet the needs of the community, the neurosurgery team is most proud of the response from patients and the quality of life outcomes. A new national program shows that neurosurgery services at MelroseWakefield Hospital is scoring above the national average in quality of life, pain after surgery and surgical infection rates. “Nothing is more gratifying than seeing patients participating in activities they hadn’t been able to do just a few weeks earlier,” said Dr. Safain.